Whether you have an artificial or a real tree, a festive skirt is a great way to cover the base of your tree. There are many different materials that can to be used or re-purposed to make a unique skirt. This is a guide about making a Christmas tree skirt. Share on ThriftyFunCheck out these crafts. If you have made this project please submit a photo and let us know how it worked. Or, add your own variation. 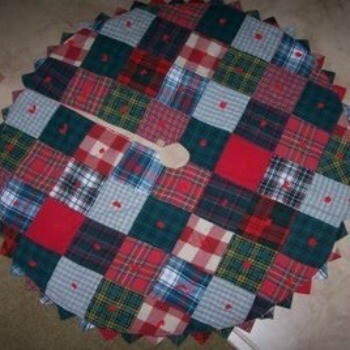 This tree skirt is made with old flannel shirts bought at the Thrift Store and made to look like the old fashioned country tied quilts. Approximate Time: Estimated time is 5 hours. When I made this, I actually made 4 so it is hard to estimate the time it took and the amount of flannel shirts required. I bought the shirts at the Salvation Army Thrift store. I guess you can say it is a recycled craft. Cut 64 squares that are 6 1/2 inches. Sew 8 squares together in a row. Do not put 2 of the same next to each other. Sew the 8 rows of 8 together forming a square piece of fabric. Matching the intersections of the corners as if you were sewing quilt squares together. Measure from the folded corner down the center about 22 inches. Measure starting at the folded corner again down each side 22 inches. Now draw a line with chalk from the side point to the center point to the other side point. Cut along this line and open. You will now have a circle. Notice that the squares at the bottom of the circle may be cut off. Save this extra flannel to make your prairie points. Make enough 3 1/2 inch squares from scraps to use for the prairie points around the entire bottom. To make a prairie point, fold the square in half, then fold in half again. Now take these squares and place them side by side as you sew around the bottom edge. Remember only 1/2 of the square is going to show on the outside forming the point. Now lay your backing fabric on top of the front fabric with right sides together and match the slits together. Pin all the way around so it doesn't slip. The prairie points are now on the inside. Sew all the way around the bottom and up the slit and down the other side of the slit but leave an opening big enough to turn inside out. Top stitch around the entire bottom and up the slits. Attach a Velcro piece at the top of the slit to hold the skirt closed around the tree trunk. Take the yarn with a big tapestry needle and go thru both thicknesses and tie the centers of each square so it now looks like an old tied flannel quilt. The prairie points can be tricky. You can make fringe on the bottom or just have it plain also. This Christmas tree skirt gives your tree that country-home feel. It is simple to make and can be embellished in any number of ways. Since it is all done with felt, the sewing can even be done by the novice or use a dull needle to let a child sew on the pieces. 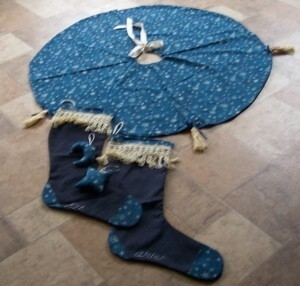 Take large felt squares and cut out 2 large circles to fit under your Christmas tree. In center of circles, cut smaller hole to fit around base of tree. Cut slit from outside to inside along back of circles. Take white felt square and cut three triangles with flat top. The triangles from top to bottom should be 1/2 the length of the radius of the skirt. This will be the body of the angel. Cut small right angle triangles from the white felt for the sleeves. Take the yellow felt. Fold it in half and cut out the angel wings. Each wing should be at least an inch longer than the angel's body. If you fold it in half, you will be able to cut out one piece with two wings. 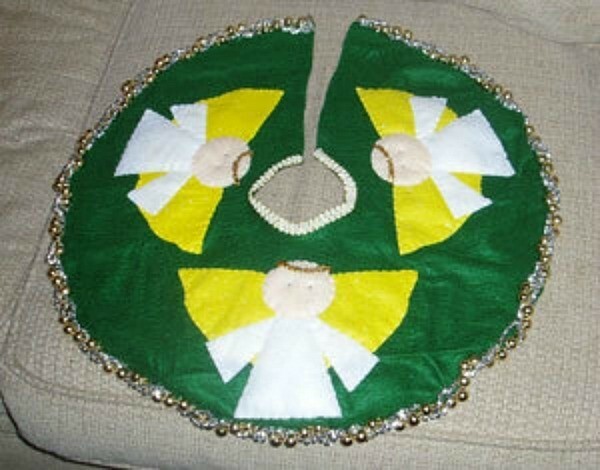 With the peach felt, you will need to cut out three large circles for the head of each angel. The circles should be one third the size of the body of your angel. Take the quilt batting and use the body to cut out three pieces of batting the same shape as the body. Do the same with the angel's head. Begin by pinning the angel wings to one piece of the tree skirt. Then use two strands of yellow embroidery thread to make large stitches sewing the wings to the skirt. Then pin the sleeves to the skirt. You should place the body of the angel so that the bottom of the body comes at least 1/2 to 1 inch beneath the bottom of the wings and fit the sleeves under the body to determine placement. Then pin the body of the angel to the skirt with the body shaped batting under the felt. Remember, the top of the triangle should be placed so that at least 1/2 to 1 inch of the body comes below the body of the wings. Continue to sew on the body with the same large stitches you used on the wings, but use the white embroidery thread. Take the flesh circles and the quilt batting and pin at the top of the triangle for the head. Use the peach colored threat to sew on the head. Using 6 strands of the blue embroidery thread (you can also use brown, black, or green) sew eyes toward the center of the face. You sew a small "X" and then a "+" for each eye. Take the gold pipe cleaners and cut a piece to form a light "U" for the halo and sew it toward the top of the head. 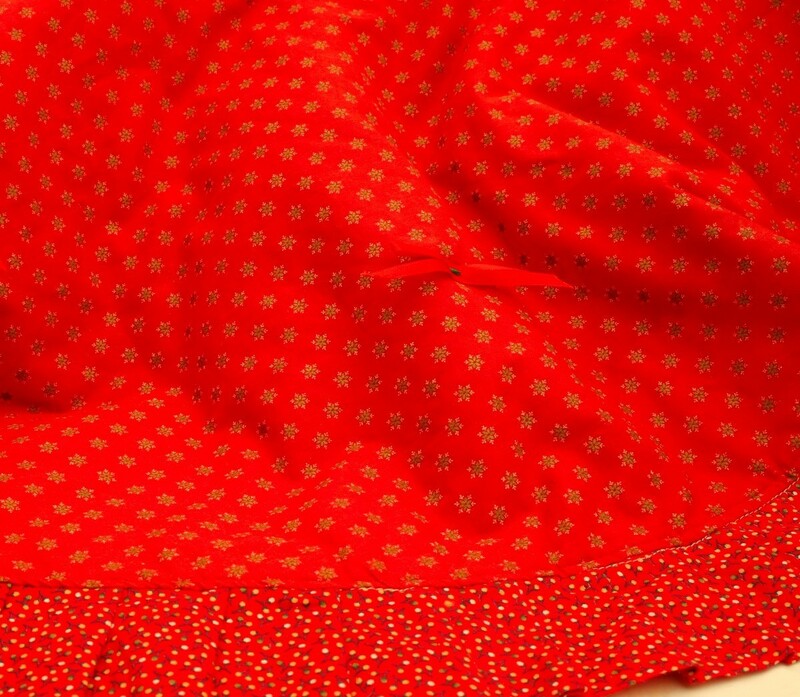 Sew the finished front of the tree skirt to the back of the tree skirt using large stitching on the outside of the skirt. For embellishment, cut a piece of garland, ribbon, or lace to fit the outside of the skirt. Stitch onto the outside of the circle. Cut a smaller piece to fit the inner circle and stitch on. For an inexpensive Christmas tree skirt, buy a knee length secondhand ladies skirt. Just select one in the appropriate color you desire. 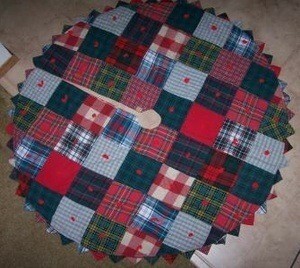 For an easy and economical tree skirt, I purchased a round holiday tablecloth (vinyl front, flannel back). I cut a small hole in the center and cut a straight line from the hole to the outer edge. It works great, is easy to clean, and my kids love the design. I'm making a felt Christmas tree shirt. I want to write Merry Christmas and Happy New Year on the skirt, but just don't have many ideas of which way I could do this. Fabric paint most probably wouldn't work. Maybe making some sort of banner with the sayings on it and gluing it on the felt? Anyone have any other suggestions? Please help. I have"Glistening snow write" by decoart.com. They have other writers. This one is like snow and sparkles. I'm sure any craft store has these writers also.I think it would complete your tree skirt. I have seen the pre-cut letters in craft stores. They have adhesive backings and come in all sizes and colors. They may work. If the adhesive doesn't hold well, you could glue gun them on. I just recently used letters that I drew myself on fabric with pencil and then cut out to applique on a wall hanging. It looks really neat because you can add shape to each letter differently and you aren't stuck with plain stencil looking words. My father-in-law passed away and he had a bunch of overalls and red bandanas. Do you have any ideas for using overalls and the bandanas to make a Christmas tree skirt? What a wonderful way to commemorate him. Good luck on your project. These are little tree skirt sets I made. One is for my daughter and the other for my grand-daughter. Christmas tree skirts can be pricey. Since they are only used once a year many thrifty folks like to fine a better decorating solution. 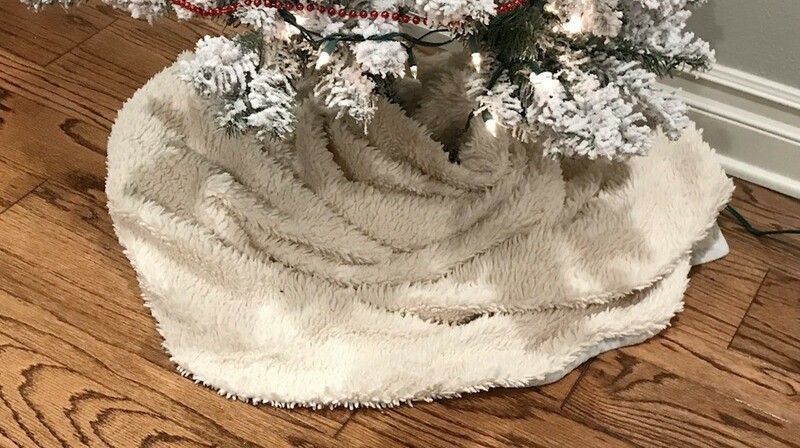 This is a guide about using a blanket as a Christmas tree skirt. A seasonal vinyl tablecloth is a perfect item to convert into a pretty, even inexpensive, Christmas tree skirt. It is easy and quick to do. 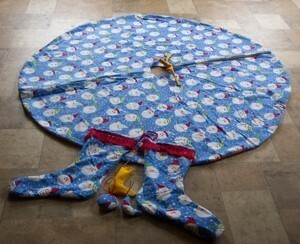 This is a guide about how to make a tree skirt with a vinyl tablecloth. I wanted to make a christmas tree skirt for a very special friend and family member. I was putting it down on paper, but I am stuck on how to do it. I have a sewing machine and I can sew by hand. I wanted to put pictures on it, how do I do this without using other machines to do it? An easy way to add cutout motifs as D suggested is to use WonderUnder or a similar product. It is a fusible web that turns any fabric into iron-on fabric. It comes with paper on one side. Cut out your motif roughly, leaving some extra fabric. Iron the WonderUnder, web down, paper up, to the back of the motif. Peel off the paper and the web is now on the back of your motif. Cut out your motif exactly how you want it to be in the end, position it on the skirt and iron again. It is now stuck down. No edges to turn under and it won't fray. I suggested that you wait to do the final cutting until the WonderUnder is applied because that means the edges won't fray when you do the final cut. If you want you can now use your machine to do decorative edge stitching around the motifs, using gold thread would add a nice festive touch. Or you could use that glitzy fabric paint that comes in a squeeze tube and makes a raised bead. For a Christmas tree skirt, I use a fabric tablecloth that I found at a $1 store.